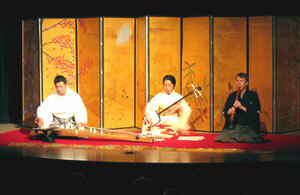 Wabash College will be treated to a performance by a well-known Japanese traditional music ensemble on Monday. The Sankyoku Trio will perform at 4:15 p.m. in the Korb classroom in the Fine Arts Center. The Trio is exemplar of the high classical art music of the Edo and Meiji periods of Japan. The trio was formed from a confluence of interest in presenting, in America, the rarely seen and heard ‘sankyoku’ (three musics). There are three classical instruments, koto, shakuhachi and shamisen performing the ‘jiuta’ ensemble music which was composed during the cal Edo period (1630-1868). That period was an unprecedented evolution in Japan’s musical arts. The trio will give those in attendance an opportunity to see and hear instruments and traditions which demonstrate a modern day musical vitality that can trace its lineages throughout the vicissitudes of the history of one of the longest-lived cultures on Earth. The trio has recently performed at the University of Kansas and University of Colorado among others. The performance is being sponsored by Wabash’s Visiting Artists Committee.